The all-new Laser ShifterPro is the most advanced laser defense system available to protect you from unwanted tickets. ShifterPro incorporates true laser diodes to maximize its effectiveness against targeting laser guns. Plus, as new laser ticketing technology is developed, the ShifterPro software is now upgradable using our exclusive Shifter Tools. Laser ShifterPro comes complete with a comprehensive owner's and installation manual, twin front-mounted Laser Shifters, panel mounted On/Off Switch, 12-volt Interface with integrated speaker and volume control, modular connections, complete wiring harnesses, and mounting hardware. High performance laser-based "Shifting" transceivers provide the ultimate protection against targeting laser guns. Our highly sensitive receiver is constantly scanning for targeting laser guns. Once a threat is detected, our true laser optic design confuses the targeting laser gun within milliseconds, allowing you to check and adjust your speed as needed. Our exclusive ShifterPro Tool software allows the Laser ShifterPro to be updated so you're always up-to-date against the latest laser gun threats. 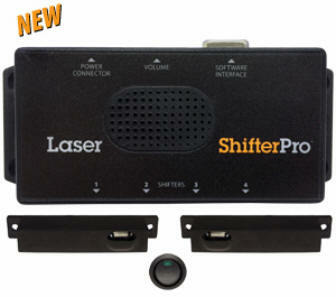 Simple and Informative Alerts Laser ShifterPro provides both audible and visual alerts. The built-in speaker provides a warning tone once a signal is detected, while the power on/off LED flashes to let you know that it has detected a signal and is transmitting. Professional installation is highly suggested, however you can do it yourself with our easy to read step-by-step instructions.